Another newer trend is the "gobo" which is a disc template that light shines through to project an image onto a surface. You can display your monogram, names, wedding date, or even designs onto surfaces such as the dance floor, main wall, or entrance to the venue for a special wedding lighting effect. One of the newest trends is fairy twinkle lighting. Every bride deserves to feel like a princess on her special day. Talk about a fairytale wedding! These elegant lights can be displayed vertical or horizontal depending on how it fits with your decor. Fairy lights are a great addition to your design to give the night a magical atmosphere. The twinkle certainly adds a romantic touch. Pinspot lighting is typically used for highlighting certain designs or decor at your wedding. Lighting up items such as flowers, centerpieces, and the dessert table is most common. Photographers are big promoters of these lights as it helps with picture quality. Pinspots add a pop to the room decor and help your beautiful centerpieces (you spent hours deciding and putting together) pop! Pinspot will ensure they get noticed. Uplighting is the foundation of all lighting. Most likely, every wedding you’ve ever been to has used uplighting to transform the ambiance of the room. The colors you choose decide the mood, so do your research on what goes best with your theme. We’ve found most people go with light lavender or champagne. These colors are more neutral and blend well with warm and cool colors. Moving heads bring energy to the party as they move and sweep the entire room. An array of disco colors typically go behind the DJ or Band setup at your venue and are displayed towards the dance floor. 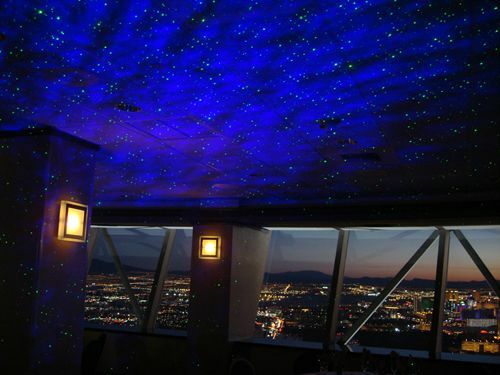 Make your event a starry night with the ceiling washed with sparkling sky views. Take an adventure into the forest with lush trees and branches, or join your wedding party in a winter wonderland with snow flakes. Laser Lighting is the highest energy, most technologically advanced lighting system. Our high end lasers have character generators to include custom shapes, names, patterns, characters, and custom designs. Go for a unique experience with UV Neon Glow-in-the-Dark lights. These lights are commonly used for post wedding reception ‘after parties’. Looking for extremely high-energy? Try black lights with DJ Silent Disco! Hottest Trend for 2019* Customize a neon sign to place above your sweetheart table, dessert table, entertainment stage, or on a green wall for photo backdrop. Different fonts, sizes, and colors are available. Customizable large letters can be placed throughout your venue! Some fun ideas are: LOVE, MR & MRS, I DO, JUST HITCHED, or your last name.